An opening partnership between Harry Towler (39) and Jonny Young (21) of 41 was the prelude to a batting collapse that saw another four wickets fall for just 42. 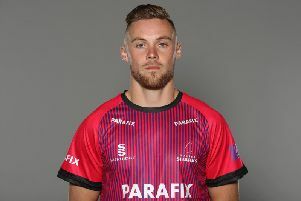 However, James Parker and Jack Palser rallied the innings with a partnership of 67 for the seventh wicket that ended with Parker being caught by James Allen for 51. Palser went next for 20 with William Wright not out 18 at the close of the innings. Mayfield’s James Allen finished with 5-88. Mayfield lost their first wicket on 18 and with three more being lost they were 127-4. However, Harry Lloyd (46), James Chaplin (51) and 44no from Edward Finch proved decisive as the home side went on to win by 4 wickets. Ansty 2nd XI v Scaynes Hill 1st XI: Having won the toss Ansty batted first but lost their first wicket with the score on 22. Tom Smith (39) was joined by Henry Smethurst (58) and this pairing added a further 64. However, when Smith was caught, another wicket fell at 92. Scaynes Hill replied strongly with openers Dan Tingley (43) and Nick Wright putting on 87 for the first wicket. Ansty’s bowlers could not penetrate Wrights bat and he finished 81no with Chris Markham 29no to seal a convincing win by 9 wickets. Ansty 3rd XI v Smallfield Manor 2nd XI: Despite 44 from skipper George Martin and 40 from Steve Kent the bowling of Shan Aroos troubled the batting of Ansty. Vince Rolandi added 23 but Aroos finished with 6-67 and Ansty with a below par score of 145. Smallfield’s reply found them at 62-5 but they lost just one more wicket to come out winners by 4 wickets. Dan Alp 39no and Goutham Gunaseelan 38 were the top scorers. Hurstpierpoint 3rd XI v Ansty 4th XI: Having won the toss Ansty elected to field and found themselves chasing 210. Ross Stuart top scored for the home side with 65 with 44 from Aaron Sayers and 43 from skipper Tudor Ellis. For Ansty Shaun Janman took 4-60 with Alex Kelly and Natasha Sole three wickets each. Ansty’s reply stuttered, losing wickets cheaply as they set about chasing down Hurstpierpoint’s total. Opener Ken Chapman (19) and Rian Brunton (24) were the chief scorers until Shaun Janman came to the crease. Janman scored 77no batting at number 9 sharing a stubborn partnership with Sally Watling who faced 42 balls for her 1 run enabling Janman to raise the score to 181 all out. Graham Plater took 5-30 and Reece Piper 3-33.